Bill Ethridge: Time Out. A Remembrance of World War II. 1998, p. 125-136. It was the kind of day when Nature invites everyone to take in large gulps of air that she has warmed with sunshine and spiced with spring growth from the countryside. It was great! The guards occasionally showed signs of being relaxed and now and then a hint of a smile would seem to say "this will soon end and we can all go home." I had referred to the winter march from Sagan to Spremberg as a forced march but now this one headed towards Bavaria showed all the signs that a race horse displays when the rider turns him towards the barn. The conviction that our forces would liberate us this very month was enough to renew the strength we needed for this walk-a-thon. I adjusted my back pack so it rode high an my shoulders and alternated my hand bag from side to side. I was determined to carry it all. Most of it was food and I was not going hungry again! Across the top of the back pack I had placed a tightly bundled great coat. It was the same type that the guards were issued, was all wool and ankle length. This was a prized possession as it had cost me several packs of American cigarettes. It would be invaluable in shedding both rain and cold. All told I was carrying about 45 pounds - not heavy by U.S. Army guidelines but it was about all I could muster after weeks of intermittent diarrhea and short rations. We had gone close to five kilometers when we first heard the sound of airplanes. We expected to see a flight or two of our own P-4'7's or P-51's just as we had recently Seen several 51's with no, Jerries in the air anywhere. We had also been told that our radio men had received confirmation of their broadcasts to friendly receivers who, in turn, confirmed their knowledge of our impending march out of Nurnberg and that our fighter squadrons were being alerted to watch for us. In the time it took to think about all this the planes were upon us and firing! I was walking an the outside of the left column and I hit the ditch as soon as I heard the fire. It seemed like a half dozen POW's fell on top as we went down. Bullets rained down along the road where we had been and some clipped leaves off the trees above our heads. Our guard fell in beside us. I was too buried to see the planes but they were identified by others as three P-47's. I suppose they hadn't received the word and mistook us for a troop movement. Several men were hit and subsequently bandaged with socks, twine and whatever strips of cloth could be made. I helped with the wounded from our group and didn't realize that there had been any fatalities until that night at camp when word was passed that a Sergeant by the name of Bill Logan had been killed. I had known of him only as one of the few non-commissioned bombardiers wearing an 8th Air Force patch. We were most fortunate that the pilots had not made a second pass. Apparently they had recognized us after the initial bursts and pulled up early. Throughout the following days whenever 47's appeared overhead they would come down an the deck and wiggle their wings, a sign of recognition. We felt safe again. We continued for twelve or fourteen more kilometers before the guards obtained permission for us to stay an a farmstead for the night. Our combine took shelter in a machine storage shed where we were fairly Bure we would not find any animal droppings. April 5. The morning sounded like home an the farm! At least one rooster was crowing at daybreak and not having a watch in the group, we had no idea of the time. Wilson and I started a fire outside the machine shed in preparation for the combine's breakfast. We had agreed the night before that it was our turn to cook so our goal was to have something hot to eat before starting an the road again. I fried one can of Spam sliced into seven pieces as Wilson mixed in diced potatoes. This, with coffee and seven chunks of bread, made a good breakfast and everyone was prepared for the next leg to Bavaria. Our guard appeared after everyone had eaten and announced it was time to put out the fire and that he wanted us an the road in "das kleine minuten." The Germans abandoned their marching routine and we walked rather casually but with a purpose: to get to the next village as soon as possible. We travelled about eight kilometers and to our surprise, found that a soup kitchen had been set up alongside a picturesque old farm house. Apparently this was not a village but just a small grouping of houses. The wives of the local farmers had prepared several pots of vegetable soup. This was a treat and our first real soup since the horsemeat stew in Spremburg. We then walked to a point about two kilometers from the soup kitchen where for some unknown reason, the guards decided we should camp until they found a place for us to stay the night. After four hours and after it started to rain, we were an the road again. Apparently no accommodations had been found. We passed through the village of Neumarkt and then an to Berching where we stayed for the night. Everyone was soaked to the skin from the downpour of rain and there was no let up in sight. There was no inside shelter for the night so we huddled together in groups of three and four. With my heavy coat and blankets from my friends covering all of us, we actually slept enough to feel rested the next morning. April 6, Berching to Plankstetten. The rain had stopped sometime during the night and daylight found us laying in all directions. After a cold breakfast of canned Australian corned beef, bread with margarine washed down with a can of coffee, we were ready to move out. Everyone was assembled around 0930. Our guard announced the next stop to be Plankstetten, where the German officer-in-charge had made arrangements for us to stay the night in a variety of buildings an the outskirts of town. My group was assigned to the barroom of an old inn. Most of the fixtures and part of the bar had been removed, leaving adequate space for everyone to spread out an the floor. Outdoor fires were not permitted because of the close grouping of the buildings, so we ate a cold evening meal and a cold breakfast the next morning. The German guards did prepare a large kettle of hot water and we made tea and coffee from packets of soluble mixes. 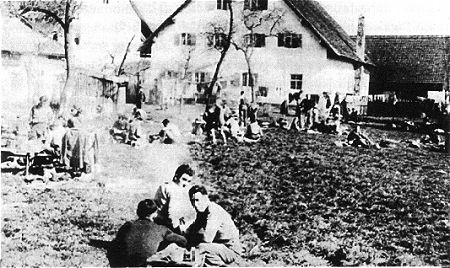 Typically, our food rations during this march from Nurnberg to Bavaria consisted of a mixture of whatever was left over from the Red Cross issues, whatever we managed to scrounge along the way, plus whatever the local people and the German guards came up with. Two staples of our diet on this march became potatoes and grain from the farm stays along the way, most of it taken without permission. We were eating better than during the previous winter months. April 7 and 8, Plankstetten. Plankstetten was picturesque with buildings that appeared to be constructed by craftsman who planned to live in them forever. The structures were for the most part heavily mortared stone with a mix of materials used for roofing. Some roofs appeared to be thatched, as one would expect to see in the English countryside, others were a type of slate and the newer ones were covered with heavy shakes. Several buildings appeared to be intended for multi-family dwellings. Rather than being two stories or more they were laid out as long, narrow structures with each family unit separated by heavy stone walls that extended above the roof lines and apparently served as fire barriers as well. The buildings were squat and solidly built as if to defy the elements of nature. The many barns were of similar material. What residents we did see were either of grandparent age or very young and all appeared friendly. I estimated the village was home to no more than 300 people. We found little material to build small fires for cooking, consequently anything hot or warm was either coffee or tea, neither of which tasted anything like British or American. I realized how fortunate we were to be Atnericans where we can have about anything we want to eat and drink. Following breakfast this morning, we moved out for our next stop in Pendorf, some fifteen to twenty kilometers farther south. April 9, Pendorf to Neustadt. Arrived after dark Last night. Traveled only eighteen kilometers as it was slow going all day. We had moved off the road several times to allow traffic to pass. Military trucks and occasionally farm wagons and livestock. No one seemed to be in a hurry either. Unfortunately a rain cloud unloaded about the time we were looking for a place to stop for the night and soaked rny clothes that had just dried from the previous rain. This was most uncomfortable but much preferred over the freezing rain and snow encountered during the winter march. It was time for food. I made a quart container of stew using potatoes, cracked wheat, powdered milk and a part can of corned beef, then joined two others who had found shelter under a large tree. We decided to sit back against the trunk to eat and sleep there for the night. No roosters crowed in the morning but we awakened early from very uncomfortable positions. After eating and making certain our fires were out, we moved onto the road and headed for the village of Neustadt, an estimated fourteen or fifteen kilometers distance. It turned out to be a good day to walk; sunny but not hot and no traffic. We arrived at our designated camp site about 1600. Although we rarely ate our evening meal this early, everyone was hungry and wanted food before sunset. Adams and Riding scrounged enough wood to build a good fire. We added dehydrated soup mixes and a half dozen chunked potatoes to a gallon of boiling water and had ourselves a good stew. A loaf of black bread rounded out the meal. We were ready for the sack and it was still daylight! The guards had received permission to billet us in bares for the night. This was great and the hay rnade for good bedding. We slept quite comfortably. April 10, Neustadt to Muhlhausen. Walked from Neustadt to Muhlhausen, about ten kilometers, where we crossed the Danube at noon. Truly a beautiful river with its gentle sounds bringing to mind memories of Strauss and his famous waltz, An der schonen blauen Donau. To this point we are about 100 kilometers out of Nurnberg but can't get a fix an how much further it is to Moosburg, our stated destination. I'm experiencing a real mix in feelings. Mainly there is the feeling of exhaustion. It's been a much easier march than the winter one, both mentally and physically. But there is a certain anxiety of not knowing when or how this journey will end that seems to be a major problem. The spirits are ebbing from high to low. Haven't had any word from home since December. Miss that. Sobolof and I, together with our combine, will be stayin~ here in Muhlhausen with about 100 others for the night while another 400 or so will continue on. The Germans are dividing us into smaller groups of about 100 each with the reasoning that it will be easier for thern to find adequate overnight shelter as well as reducing the concentration of traffic an the road. Today we have seen a sudden increase in both German military and civilian personnel moving towards Bavaria. One German guard told us that Bavaria is "safer for everybody." We camped in a grassy field outside of town, prepared whatever food we could put together and settled down to rest. It was a warm and sunny spot and proved to be one of our better rest stops. April l and 12, Muhlhausen to Wildenberg. We broke camp around 0900 and walked to a private farm near Wildenberg. A man and wife, judged to be in their 50's told us they were the owners and had lived here and farmed this land for thirty years. They had two daughters, both of whom appeared to be in their late teens or early twenties. Apparently they expected us and had prepared kettles of hot water over outdoor fires. They invited us and our guards to help ourselves. They added that we would be sleeping in the hay harn, but there must be no smoking. Later they gained assurance from the German guards that we would not smoke. This was agreed to and enforced. As Sampson and I were getting hot water for coffee, the farmer came by and asked us if we drank beer. He said that he did not have any beer to serve this many people but that he would like to show us something and motioned for us to follow him into the house. We followed out of sheer curiosity as he lead the way into what he called his game room and pointed to a collection of beer steins neatly arranged an shelves placed around the perimeter of the room about head high. He said that he had about 500 and had obtained some from every country in Europe. He took several of his prized ones from the shelving and told how he had obtained these special ones. They were beautiful and obviously he treasured them. He then pointed to several of his game trophies. There were about six different heads, including moose, antelope and deer. He concluded the tour by saying that he hoped the Americans would not destroy any of this. It was obvious that he had foreseen Germany's collapse. We responded by telling him that we believed everything would be safe and we silently hoped so. We thanked him for inviting us in and left as politely as possible. It was another nice day and everyone, including the guards, enjoyed it. After the evening food preparation we hit the hay. I slept very well. The next morning, the roosters crowed early and so most everyone was up and preparing breakfast by 0800. Sobolof spotted one of the farm girls coming from the chicken house with a basket of eggs and decided that he and I should have eggs for breakfast. I urged him to go ahead and talk to her. With his ability to speak and understand some German he succeeded in talking her out of two eggs an the promise that he would tell no one else. He handed the eggs to me to cook, saying that he never cooked anything in his life. I had already sliced potatoes into a pan and with the addition of the fresh eggs we enjoyed this breakfast like no other. The odor of frving eggs gave us away but we both swore that we had been carrying these for days and that we had found them at the last farm stay. At 1100 we watched a squadron of P-47's bomb a small highway bridge nearby. I wondered if Mary's brother was one of the pilots. There were no German flghters to be seen. In fact we saw only two German aircraft an this entire trip from Nurnberg to Moosburg. As we were preparing our noon meal, the farmer brought two wheelbarrows full of potatoes and dumped them an the ground, commenting that we should help ourselves. We did. Some would be cooked, some would be eaten raw. We would be staying here a second nicht and the word got around that some of the prisoners were planning to burrow into the hay and stay an after the others marched out the next morning. Apparently this had been tried before because the Oberlieutenant in charge of the guards announced before we bedded down that they would call everyone out in the morning and take roll. Any one missing would be assumed to be hiding in the hay and the hay would be sprayed with machine guns. After roll call the next morning, even though it appeared as though everyone was present, the guards proceeded to empty two submachine guns into the hay! I suspect the farmer wasn't pleased. Two American officers thanked the farmer and his family for their hospitalitv. We were an the road by mid morning. April l3, from farm to farm. Today's weather was a rmixture of rain and sunshine with daytime temperatures in the low 60's. It was just about right for walking but as it turned out, we would not be going very far today. The rumor was that the Grmans had been asked to leave the last farm because a guard had paid too much attention to one of the daughters. Whatever, the Germans had subsequently learned that the owner of a large farm outside of Mulhausen might be agreeable to letting us stay for a few days if we would cause no pnoblems. The senior American Captain assigned to our group assured the Germans that they could expect appropriate behavior from us. The Captain reminded the senior Gernran officer that his men were also expected to be on their good behavior. The second farm appeared to be a prosperous one, a combination hay, wheat and dairy operation. Judging from the number and size of the buildings there must haue been at least 500 acres at their disposal. The buildings were arrarrged in a U, starting with a two-story house an the right side of the wide entrance to the farm Yard. It was sort of Dutch Colonial in design and looked like it may have contained four upstairs bedrooms. It was painted white, trimmed in green and faced the central yard. Adjacent to the side of the house away from the road was a small building used for milk cooling and cheese making. There was a dairy barn with a hayloft, crosswise between the cheese building and a large machinery barn. Returning back towards the entrance from the road and directly across the yard from the house was the granary. A huge manure pile was discretely placed behind the harn. The manure reminded me of stories by my maternal grandmother Herberer who told about how the Germans aged their Limburger cheese in their manure piles to take advantage of the heat they generated. I asked a German-speeking friend to find out if this was ever the practice and he was told that this had been done in past years bat that they were no longer doing it the old way. Our combine shared the machinery storage shed with other combines, and our seven men set up an independent cooking space in a covered area next to the granary. Being an ex-farm boy, I had seen an advantage of being close to the grain storage. We were permitted to spread wheat straw on the floor of the machine shed and this made for rather comfortable sleeping. One of the problems with sleeping amongst a large group was that invariably someone would have to get up during the night and stumble over a dozen people before arriving at his destination. To get out of the traffic I had the brilliant idea of sleeping under a cultivator. I was out of the way, had plenty of straw and was really very comfortable, but during the night I had to go for the outdoors. The night was black and I somehow forgot where I was. As I sat up, my head struck a metal cross member on the cultivator. Slightly stunned, I managed to find my way outside and return without much of a problem. The next morning I was awakened by a roommate asking if I was alive. It turned out that my face was covered with blond from the blow an the cultivator and he thought that I had been wounded. One of our combine, Edward Riding, had developed a sore throat a few days before arriving at the farm and was running a temperature. He was a close friend from Room 5 in Sagan and a former pinochle Partner. He was always one of the "up" roommates, the first to help cheer up anyone in need. Hack Wilson, nur leader and first aid man, was certain that Riding's temperature was dangerously high. Wilson and nur Captain Barnett convinced the German commander that Riding should be seen by a local doctor. The commander agreed and Ed was taken to the local clinic. The examiner's diagnosis was strep throat with a critically high temperature. We were advised that Riding was put to bed and given the medication that the German doctor always used for these illnesses. This was on the l3th. Over the hext two days we were advised that the fever had improved, but then on the l6th we were told that Ed had died. We were shaken by the loss of our friend, and skeptical of the treatment he had received. Gaptain Barnett spent some time with our combine and assured us that he had been permitted to talk with the doctor in the clinic. He was convinced that the MD and his assistant had done all that was possible to save our friend. We accepted Barnett's assessment then asked him to obtain permission for those of us in Riding's combine to attend the the burial. The Germans granted our request and set the burial date for the next day, the l7th. All six remaining members of the combine were designated as pallbearers. The closest cemetery was an the grounds of the local Catholic church, just a few kilometers west of the village of Ober Rummelsdorf. The casket was carried by a Small military treck. We walked behind the treck and were followed by three soldiers carrying rifles. A grave had been prepared alongside of the church adjacent to the roadway. From this point we could look back down the road we had walked and could see the village. A proper place, I thought. Six of us were directed to line up along side the casket after it had been positioned above the open grave. With three an a side and Captain Barnett at the foot of the casket, the priest moved to the head of the casket and opened his Bible. The soldiers fired three volleys from their rifles, the priest read in English from his Bible, we each saluted and then picked up a handful of the fresh dirt and sprinkled the casket as it was being lowered. This ended the ceremony and we walked back to the farm. Conversation was muted that night. We thought about those makeshift graves hacked from the ice and snow by the civilians during our Winter march and were thankful that our friend had at least been given a decent burial. My one major regret was that I did not record the name of the priest nor the church nor verify the name of the parish. I would have liked to pass this on to Riding's relatives in Macon, Missouri. April l9. We have camped in the farmyard for six days and today we've been told that we must prepare to leave tomorrow. Beyond saying that we will be going further south into Bavaria, the guards haue said little that would indicate our destination. There have been rumors to the effect that we may be an the road until General Patton's tank divisions drive into this part of Bavaria and overtake us. Other rumors have it that, regardless of what Hitler decides, Bavaria is about to set up a separate government and surrender to the Allfies and we would be safe in Bavaria. I preferred to be on the road and let Patton liberate us. The past few days fit has been difficult for our combine to accept the death of our friend. Not much of interest has transpired since his funeral. We have settled down to a daily routine of sleeping, eating and exercising and generally doing what we feel is necessary to help improve our strength and health. Our combine was visited by an American Major yesterday whose only apparent purpose was to ask questions about Riding. He stated that he would be passing any information along that might help prepare others to recognize and report the first signs of a serious illness. We described the symptoms our friend had described to us including what I thought was a very crucial point. Riding did not share his feelings of a high fever or of a sore throat to us until three days Prior to his death. Riding was not one to complain, however, had we known more about his condition early enough, maybe someone could have helped. Purely speculation. April 20, Neustadt to Pfeffenhausen. We assembled an the road between 0800 and 0830 this morning and walked from Neustadt to Pfefferhausen, a distance of twenty-four kilometers. It was a quiet, warm, sunny day and the scenery was as beautiful as one might find in a travel brochure. I would like to bring Mary to this part of Germany some day. We had a pleasant surprise as we entered Pfeffenhausen. A group of German women had set up serving tables in the shade of a small storage building. They offered sandwiches made with a heavy dark bread and meat paté, and sandwiches made with lighter colored bread with what tasted like gooseberry jelly. Both kinds were delicious and excellent examples of home cooking. Plenty of coffee was available but it was not very good. Apparently fit had been made from roasted or burnt barley. Most of the women were talkative but one's remarks summed up what seemed to be the group's feelings when she said: "The war for us is over." We were assigned places to sleep in various buildings and my group was assigned to the basement of a large house. Somehow it seemed as though our combine drew more basements than any other group, but with the threat of a rain shower, it would be better than sleeping outside. Although the basement was damp, by laying out several boards that had been loosely placed over a large cistern we had a dry pallet to sleep on. It didn't compare with the hay from our farm stay but the basement was dry. April 21, on to Moosburg. Bread and butter washed down with hot Sanka was our breakfast. We hurried this one a bit because the Germans announced at 0700 that "we are going to Moosburg." No one knew where Moosburg was but an American Colonel told us it was very close to Munich and only about 25 kilometers away. This was great news! With the exception of three German military trucks and several farm wagons, there was almost no traffrc and we made excellent time. The threatened rain of the night before had not materialized and the sun was out and the sky was clear. It was a beautiful day and everyone seemed to be in a happy mood. The news from our clandestine radios had been reporting the progress of General Patton's drive towards Munich and we now believed we were heading in a direction that would intercept his drive! Everyone hustled and we approached our destination just minutes prior to 1600. Our first glimpse of Moosburg revealed the twin towers of the cathedral. In fact it is one of few German cathedrals having twin towers. At 1630 our combine entered the main gate of Stalag VII A. Bill Ethridge: Time Out. A Remembrance of World War II. 1998, p. 125-136 (book order). Reproduction kindly permitted by © Bill Ethridge. Last update 15 May 2000 by © WebTeam Moosburg (E-Mail) - All rights reserved!